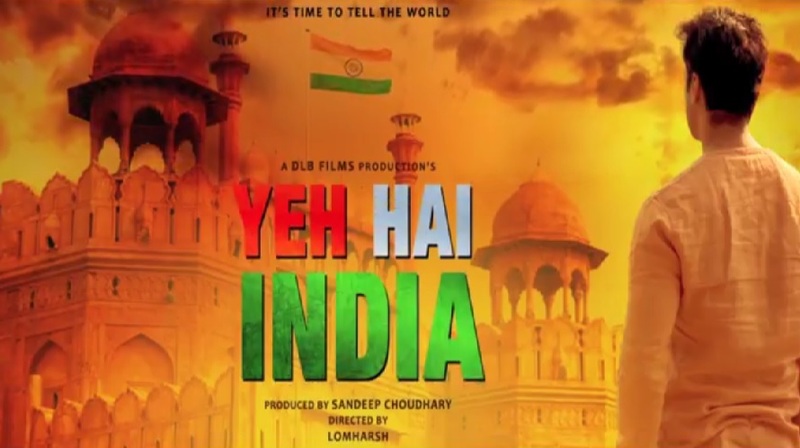 The first official motion poster of upcoming patriotic film, Yeh Hai India is out. Yeh Hai India stars Gavie Chahal, Deana Uppal, Mohan Agashe and Mohan Joshi in the lead roles. Yeh Hai India is a story of 26 year old NRI who comes to India with stereotypical views about the country and how his perception changes? The movie follows the journey of what it takes to be an Indian and the idea of India from past to present. Yeh Hai India is written and directed by Lomharsh. It is produced by Sandeep Choudhary under the banner of DLB Films Pvt. Ltd.
Gavie Chahal who plays the main lead, talking about Yeh Hai India said, “It was amazing to be received like that, especially by the audience, it’s them who matter the most in the end. The crowd was terrific and the energy could be felt throughout the event”. TV Actors Talk About April Fool Pranks! Indian TV : Shows That Are Not To Be Missed This Week! Yeh Hai India Selected As The Official Entry For FOG Film Festival!